Twitch viewing app for Xbox 360 video game and entertainment console from Microsoft now available for download in the US from the Xbox Live marketplace. SAN FRANCISCO--(BUSINESS WIRE)--Twitch, the world’s leading video platform and community for gamers, today announced the release of an app to watch Twitch directly from the Xbox 360® video game and entertainment console from Microsoft. Available for download from the Xbox Live® marketplace in the U.S., users of the app can tune into Twitch to watch a diverse array of live streaming content right from their living room. With Twitch’s audience now exceeding 34 million unique viewers per month, this latest expansion to Xbox 360 strengthens the company’s goal of being everywhere that gamers are. "Our app for Xbox 360 brings Twitch video to the television and into the living room of millions of Xbox Live members for the first time," said Emmett Shear, Twitch CEO. "The app will let every Xbox Live gamer find and watch streams of their favorite games from their couch! Given the huge number Xbox owners and how many of them love gaming spectatorship, it's a natural fit to bring the Twitch experience to the 360." Since launching at E3 in June of 2011, Twitch has experienced explosive growth in viewership, now exceeding 34 million unique viewers per month. The Twitch app for Xbox 360 caps a long list of high profile partnership announcements with the video game industry’s biggest game brands, including Ubisoft, Electronic Arts, Activision, Sony Online Entertainment, and others. 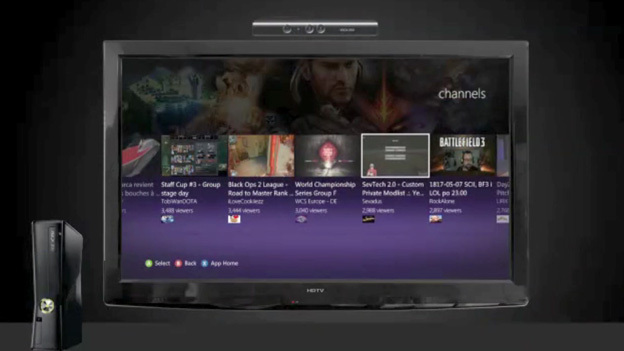 With the new Twitch app for Xbox 360, gamers will be able to watch the top 300 live Twitch channels. Viewers will be able to browse videos by channel, by game and by featured content. The Twitch app is initially available to Xbox Live Gold subscribers in the U.S. Along with launching this exciting new app on Xbox 360, Twitch will also host an exclusive broadcast following the May 21st #XboxRevealed event at 12:00pm PDT. The broadcast will be presented by Larry Hryb, aka Microsoft’s Major Nelson, live via the new Twitch for Xbox 360 app as well as Twitch. Twitch is the world’s leading video platform and community for gamers. More than 34 million gamers gather every month on Twitch to broadcast, watch and chat about gaming. Twitch’s video platform is the backbone of both live and on-demand distribution for leading video game broadcasters including casual gamers, pro players, tournaments, leagues, developers and gaming media organizations. Twitch is leading a revolution in the gaming community, working to create a participatory experience that transcends gameplay. Learn more at http://twitch.tv. Twitch has announced the release of an app for Xbox 360 from Microsoft that enables viewing of live streaming content from Twitch.tv, the world’s leading video platform and community for gamers.